Last year we wrote a post on Flexible Water Hoses, better known as Flexi Hoses and whether they are a Help or a Hindrance. 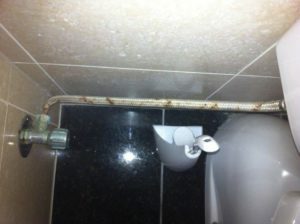 The article was sparked from our observations of the increasing failure rate of flexi hoses in domestic applications. flexible hoses accounted for 22% of water damage claims in Australian households in 2016, with properties between 11 and 30 years old most likely to suffer an escape of water claim. 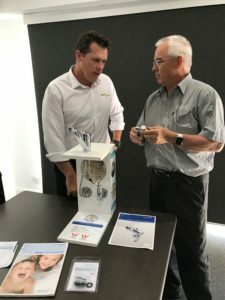 Recently we met with Ian Carmody, Technical Product Advisor for Con-Serv, to discuss their Flood Stop devices that are used to prevent water damage in homes due to the failure of flexi and/or dishwasher/washing machine hoses. The purpose of this article is not to review the Flood Stop devices provided by Con-Serv. For further information on these quality products please see the links below. The purpose of this article is to highlight a discussion we had with Ian and get your thoughts on the question below. Why do flexi hoses fail when no-one is at home? Ian’s answer was extremely insightful and while it is based on his professional opinion and not any specific or conclusive evidence based research, it is certainly a position worth considering because it just makes sense. In answer to the question Ian said that over any normal night when we go to bed, the house pipework pressurises because there is no release of water and it is not until the morning when a tap is turned on or the toilet flushed that the pressure is released. From that point on water is used throughout the day depending on the occupant’s requirements and lifestyle choices. Historically houses were always hard plumbed with copper and metal pipes and they tended not fail under pressure due to their rigid design. 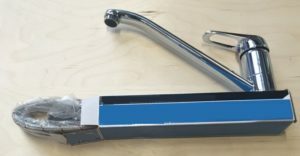 With the introduction of flexi hoses, a weaker point than metal was introduced into the system, even though the rubber inner tube is wrapped in and retained by the outer braided stainless steel sleeve. As we know the biggest problems with flexi hoses is damage prior to or during installation. If the flexi hose is damaged due to it being kinked, stretched or twisted, or even if the sleeve has started to corrode, this introduces a weak point into the hose and its integrity is compromised from that point. Overnight as the system pressurises the water is seeking a path of escape. 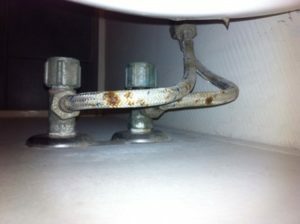 This pressure can cause the weak point in the flexi hose to bulge, even ever so slightly. Night on night, this point will be under pressure, stretching and then releasing the pressure in the morning. Like blowing up a balloon ever so slightly and then letting the air out, this stretches the inner rubber tube over time, starting at microns and ending in millimeters, applying greater pressure on the compromised outer sleeve. What Ian says happens when you go away on holiday is the system is under pressure and remains so the entire time. Because water cannot be compressed it is seeking a path of egress and under continued pressure, with the stretched inner core now the weakest point in the system continually under load, it can fail and unchecked pump thousands of litres of water into the home. The better quality flexi hoses come with a maximum warranty of 10 years and it is for this reason regular inspection of the hose for damage is critical, ensuring you do not fall victim to a burst flexi hose. The flip side is understanding a burst pipe/hose can deliver 1500 litres of water an hour into your home in a very uncontrolled and unplanned manner, hence the market for the Con-Serv products. Ian’s explanation made sense to me.